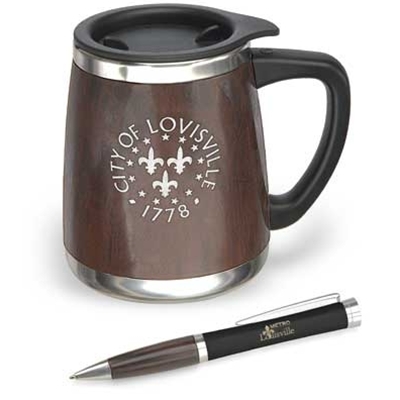 Bosque is Spanish for woodlands – a fitting name for this handsome, glossy wood mug and pen set featuring the Louisville Vintage Seal logo. The 14-oz mug is lined with stainless steel, and features a large handle, rubberized bottom, and press-on plastic lid with drinking hole. A nice gift for the office. Comes in a gift box.